October has traditionally been the best month for local fans to catch top-notch anime on the big screen, what with the Hawaii International Film Festival bringing in some of the latest and best films (and in recent years, select classics from yesteryear). This year, though? Looks like we’re going to have two months of big-screen anime awesomeness to look forward to: October … and right now, as film distributor Eleven Arts has quietly turned this month into a three-film anime feast. We already knew that Evangelion 3.0: You Can (Not) Redo was coming here, to the Ward Stadium complex on Oahu and the Kaahumanu 6 theaters on Maui on Saturday and next Tuesday, then to the Honolulu Museum of Art’s Doris Duke Theatre Jan. 29-31. (From what I understand, free tickets are still available for anyone with Kawaii Kon three-day passes from 2013 or who have preregistered for 2014; see this post for details.) 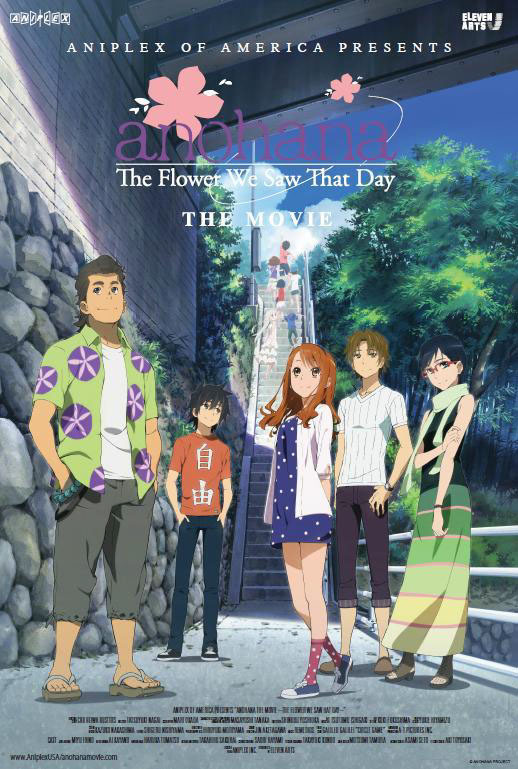 We also knew that Anohana: The Flower We Saw That Day: The Movie was heading to the Kaahumanu 6 theaters on Jan. 22 and 25, seemingly skipping Oahu and getting me to casually contemplate whether I should fly out to see it. I never did buy that plane ticket. Probably a good thing, too, because a quick check of the official movie site reveals that yes, Honolulu, you’ll be getting some Anohana love as well. Same days as Maui, too, albeit at different times: 7 p.m. on Wed., Jan. 22 and 2 p.m. on Sat., Jan. 25, both at the Ward Stadium complex. Tickets are $15 for each showing. Madoka Magica: Rebellion is also returning to Oahu, too, for those of you who might have missed the screenings last month at the Doris Duke. That’s happening … right now, in fact, as the film is in the middle of a limited engagement at the Pearlridge West theaters. While the Rebellion website lists it as running through Jan. 16, I’ve only been able to confirm it through Thursday, so the sooner you catch it, the better. Showtimes are at 11:30 a.m. and 2:05, 4:40, 7:15 and 9:50 p.m.; tickets are at standard prices ($10.50 general, $8 matinee screenings before 4 p.m., $7.50 seniors 60 and older, $8 military with valid ID, $8.50 students with valid IDs, and I’m not even going to mention the “children ages 3-11” price here, because children that age shouldn’t be watching this movie anyway). And then there’s Evangelion 3.0, the movie that’s starting to approach “if you want to see it in theaters, you probably will somehow” levels in terms of the number of screenings these next few weeks. A total of 35 screenings have been added, to be exact, at the Pearlridge West theaters starting Friday and running through the 16th. Showtimes are at 12:20, 2:45, 5:15, 7:45 and 10:05 p.m., and here’s your ticket link (ticket pricing structure is the same as Rebellion). See you at the movies, folks. Indulge in some popcorn while you’re there, too. C’mon, you deserve it. Didn’t see Madoka Magica running when I went to Pearlridge West this Tuesday and notice it’s not listed for this Thursday either. However, for those who insist the subtitles are the only way to watch anime should be happy to know the Eva movie shown at the Pearlridge West is the subtitled one. Recently I bought an issue of “Otaku USA” magazine. Was it ever a harbinger of disappointment by way of comments on “Evangelion 3.0” and “Ghost in the Shell: Arise”! I was thinking that Eva 3.0 would pick up after Shinji was left hanging in air by someone arriving from Moon base in Eva 2.0. Nope; it starts with “time passes” and so on.